If you have frozen chicken wings, you'll need to defrost them thoroughly before use. If they are already cut into flats and drumettes, you're good to go. Otherwise, if there's a wing tip attached, cut it off and discard it or keep it for stock. Cut through the elbow joint to separate the two parts of the wing. Dredge them in the baking powder - this adds to the crispiness of the baked wings. You may want to add a little salt and pepper to the baking powder, but I don't think this is necessary. The traditional recipe calls for deep-frying, but I'm baking them. Preheat your oven to 200&deg; C (392&deg; F) for a fan oven, or 220&deg; C (428&deg; F) conventional. Line a shallow roasting tin with foil, place a wire rack over it and arrange the chicken wings on it. Bake for 25 minutes, then turn them over and bake a further 15 minutes. While the wings are cooking, melt the butter over medium heat. Add the hot sauce. Stir well and keep warm until needed. Cut the blue cheese into small chunks and blend it into the mayonnaise and cream with a fork. Stir the baked wings into the sauce until well-coated. Arrange on a plate or platter, and pour any excess sauce over them. Serve with the blue cheese dip in a small bowl, and some celery sticks. The video above is from the Keef Cooks YouTube channel. 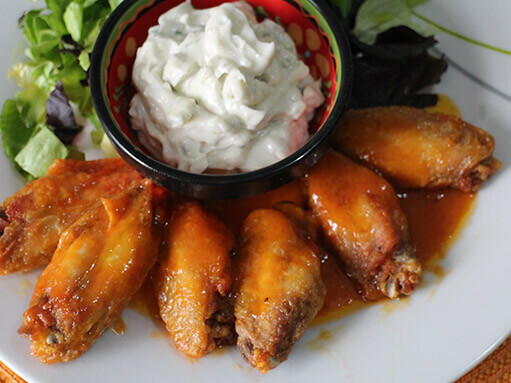 Click here to see the video recipe of Buffalo Wings on YouTube. The authentic hot sauce is Frank's, from Louisiana but I think you can use anything you like. The exact amount depends on how hot you like your food, but it shouldn't be screamingly hot. You can use any mild blue cheese for the dip.